Floating and Balanced Power Amplifier with MOSFETs The basic design of the power amplifier circuit adopts a unique floating and balanced power amplifier technology developed by Yamaha. Adopting output elements with the same polarity on the plus and minus sides of the output stage, along with completely separating the NFB (negative feedback) circuit and power supply into a total of four plus and minus sides of the left and right channels, results in a thoroughly symmetric push-pull operation of the output stage. Completely floating the entire power amplifier circuit from the ground removes any negative impact of minute voltage fluctuations or ground noise. Moreover, the output elements are comprised of MOSFETs, which provide a warm and natural sonic characteristic in the audible playback. The use of MOSFETs, which have the same polarity on the plus and minus sides, further evolves the ideal symmetrical design to eliminate sound quality variations due to difference in polarity, a major distinguishing characteristic of the floating and balanced power amplifier. This results in sound with a superior signal-to-noise ratio and superbly well-defined sound fields. Dedicated Single-Ended Amplifier for All Types of Audio Sources Since this device employs a dedicated single-ended amplifier, it provides excellent response in the amplification of single-ended analog sound from all kinds of audio sources such as CD players and D/A converters. By fully utilizing single-ended amplification, the A-S1100 transparently draws out the intrinsic qualities of your favorite audio devices, including those made by other manufacturers. All-Stage Full Discrete Configuration for Strong Reproduction of High Notes This amplifier adopts an all-stage, fully-discrete configuration through all sound circuit stages using only the most meticulously selected, high-precision parts from input to output (applicable during tone control circuit defeat). The slew-rate of the audio signal has been improved to bring lively and strong response to high musical notes. Moreover, the tone control circuit lets you switch to the defeat-state and enable a full discrete configuration that bypasses the op-amp IC of the internal circuit, simply by setting the BASS / TREBLE knobs to their center points. Thorough Low-Impedance Design Ensures Powerful Bass Response with an Extremely Dynamic and Energetic Feel By strengthening the capacity of the high-current route (raising the section area of the cable core wire to about 60% of that of the A-S1000) and by pursuing thorough low-impedance design and forming screw-clamped wire connections of major ground points, the A-S1100 boasts excellent speaker drive power with a damping factor of more than 250 (8Ω, 1 kHz). Along with the large capacity power source transformer equipped with an EI core, this design delivers bass reproduction that is both strong and uplifting. Large Capacity Power Supply Unit Delivers Energetic, Dynamic Sound with Fast Response The A-S1100 employs an original EI transformer, carefully customized for optimum compatibility with the chassis. Combining four large capacity carbon sheath block capacitors delivers an energetic sound, even during high volume that is only possible with the A-S1100. Moreover, since the control amp and control system is equipped with twelve shunt type local regulators that prevent deterioration caused by current fluctuation, a clean and stable power supply is achieved. The EI transformer is mounted on the chassis using a brass washer, restricting internal vibration that would result in noise. Superior Quality Electronic Volume Control for Optimum Sound We’ve utilized a high-quality digital volume control specially designed by New Japan Radio Co., Ltd., which consists only of ladder-type resistance, removing the impact of slew-rate decline or coloring of the sound. This delivers higher purity in the sound and excellent, fast response to large volume changes and steep transients. Moreover, the tone controls employ a triple-parallel method, minimizing the detrimental impact on sound quality seen with straight-line tone controls. In addition, the bass, treble, and common circuits each utilize simple construction in which the NFB of the amp is not used and the CR elements are simply fixed in a straight line. This ensures exceptional sound reproduction even when tone control is applied. When tone defeat is applied, straight signal flow from one volume circuit to a discrete configuration buffer amp is achieved. Symmetrical Design in Pursuit of Ideal Stereo Reproduction The left-right symmetrical construction with the power supply in the center and the ends of the power amp blocks achieves greater separation of the left and right channels. This is necessary for proper two-channel stereo reproduction and ideal weight balance. The center frame is fine-tuned which extends from the front to the back of the casing and with specially made metal legs (selectable from spike or pad), the A-S1100 has superb mechanical rigidity and installation stability that dramatically lessens the impact of external vibrations on sound quality. Discretely Configured Phono Preamp The phono preamp is comprised of a MC head amp and an equalizer amp, each of which are discretely configured, resulting in a rich sound with pronounced musicality when playing vinyl records with both MC and MM phono cartridges. Level Meters Visually Reflect the Dynamics in the Music The center of the main unit features level meters that provide visual enjoyment of the music with rapid or delicate movement of the needles. The meter is illuminated softly from inside by LEDs, giving a warm, beautiful lamplight look. The meter indicators, along with VU display, can be switched to show peak power as well, according to your preferences. The meter’s window has been precision-fit to the panel and lays completely flat with no gaps for an elegant and beautiful appearance. Elegant Design with Luxurious Real Wood Panels The refined design and construction of the A-S1100 reflects the commitment to fine craftsmanship and art that Yamaha has exhibited for over a century as a world-class musical instrument maker. This amplifier offers a metal front panel and side wood panels that have been beautifully integrated by the masterful use of advanced technology. Moreover, the dials and tone controls are machined aluminum knobs for a richly textured finish and graceful touch. Original Speaker Terminals Combine Ease of Use and Beauty with High-Quality Sound Our meticulous obsession with quality continues through to the speaker terminals, which are the last and crucial link in the audio chain. The screw-type terminals with originally-designed handles are created by cutting pure brass. This enables a secure connection with no reduction in sound quality. Contoured to the shape of human fingers, they not only look beautiful, they can be turned easily and fastened tightly with minimal effort. They are also compatible with connections that use banana plugs. Remote Control with Simple Design and Superior Texture The supplied remote control features a design complementary to the aluminum front panel of the amplifier with a simple, easy-to-understand button layout and a gorgeous metallic texture. 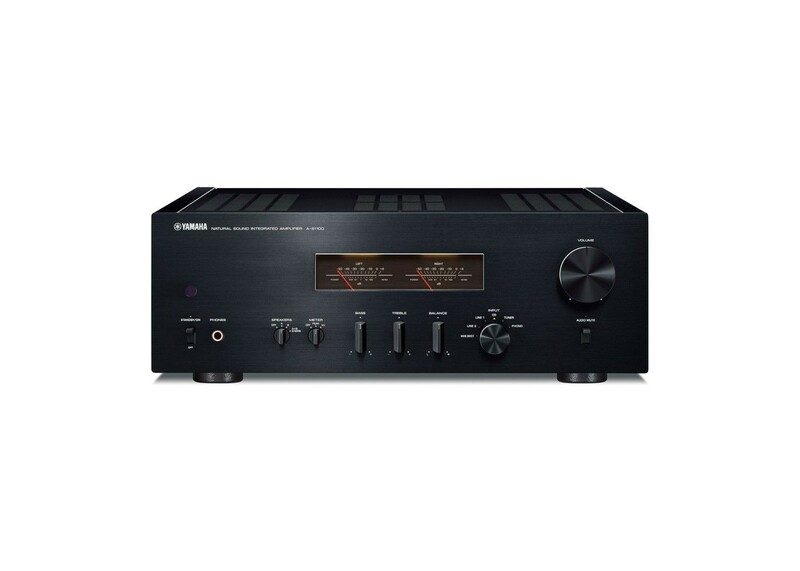 In addition to the basic volume adjustment and input switching controls of the A-S1100, it can also be used to operate Yamaha CD players.